University students have to buy passes. people who are interested can contact Bilal Khan and Ali asghar Marvi for the passes.
" 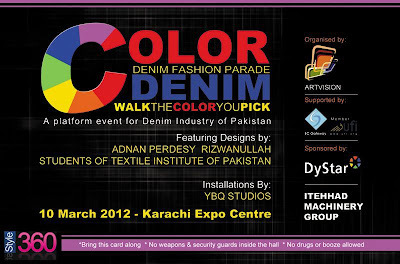 DENIM FASHION PARADE "
TEXTILE ASIA going COLORS this year with featuring an exclusive Denim Fashion Parade presenting COLOR DENIM for the first time on ramp in Pakistan. Leading industry designers participating in the show presenting future styles and presentations in shape of designer concept wear garments and installations made by denim. DENIM FASHION PARADE is the only Denim Fashion Industry platform available for designers to showcase their creations and ideas to the international & local industry & designer streets. 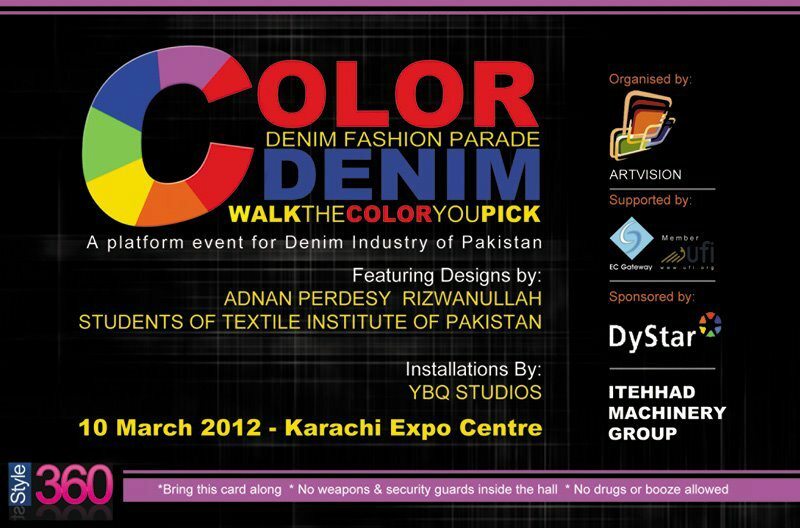 DENIM FASHION PARADE would serve as the bridge between Fashion Street Designers & Textile Industry. DENIM FASHION PARADE would also help the manufacturers to work closely with the featuring designers in scope to create Pakistani brands & labels and take them to international markets.